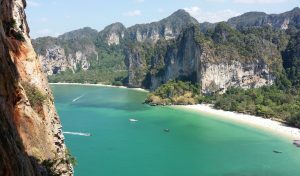 Every year on Valentines day couples profess their love with weddings that take place on the beautiful limestone cliffs of Phranang beach; well known for its white sand and vibrant turquoise ocean, it’s also an especially romantic place for Thai people, where wishes for blessed love are hopefully heard and granted by the spirit of the Phranang Princess. 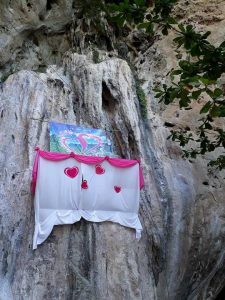 The cave at Phranang beach is dedicated to the princess of Phranang, as one story tells it, this is where she waited until her dying day for her true love, who on his way to marry her died at sea. Many Thai people believe this place to be lucky and sacred, a place where the spirit of the Princess still resides, and if prayers and offerings are bestowed upon her she will grant your wish; most commonly people send out a wish for love, marriage and fertility, and a very common offerings is a carved phallic symbol, as they are also believed to be lucky; I have heard a few stories around this too, one is that the fishermen wear small ones to keep them safe at sea and ward off sea spirits that would pull them under. These stories are Thai folklore, which is meaningful in Thai culture, so it’s best to treat with respect, and enjoy the beauty of the area! 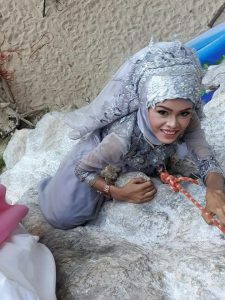 If you are interested in getting married on the rock next Valentines Day, your wedding ceremony will be fully paid for, as well as your hotel. Please feel free to get in touch if you want more details on how you can be one of the the next couples to profess their love in this romantic way. The Railay Climbing Club works with the Railay Tourism Club, the Tourism Authority of Thailand, and the Government to put this on, and it’s truly a spectacular event! A special mention to all the climbing guides from the different companies who worked together for many days to set the stage for this, and who safely got everyone on the rock for their special day! 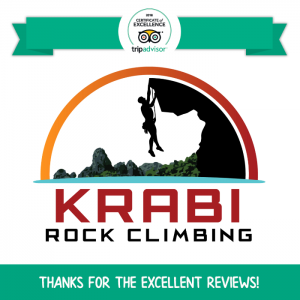 Krabi Rock Climbing sends out a big thanks to our customers for their reviews, and to our amazing instructors for providing another year of excellent service! See the following link for the full article. 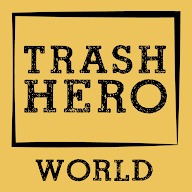 Unfortunately the deep water solo trip is currently not running, as the nature park has banned this activity in Thailand. We do hope that in the future this ban will be lifted, the Railay Climbing Club has been in discussion with them regarding what it would take to reopen, however currently we have no updated information to provide. If you are interested in sport climbing, we will be happy to have you climb with us. 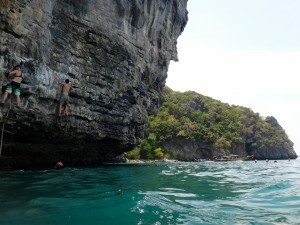 Sport climbing is the really famous thing to do in Krabi, and the locations in Railay are beautiful. There are many routes for the beginner – advanced climber, with single-pitch, and multi-pitch routes available for you to enjoy! 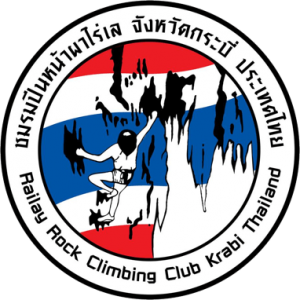 Rock Climbing in Krabi Featured 🙂 Presented by: Media Studio & คุณธันน์ ธนากร & Railay Climbing Club!